For every gallon of oil burned 1/4 - 3/8 inch of wick is consumed. Oil lamps/lanterns burn about a 1/2 ounce of oil per hour. A gallon of oil will last you 512 hours! This generalization will significantly vary depending upon the size of your wick, type of oil, height of wick, among other variables. The point: a small amount of oil will go a long way. Click to read how long your wick should be. Oil Tips: Keep oil lamps and lanterns half full for optimal burning. Wicks are rapidly consumed when oil tank is very low. Do this and you will not run out of oil unexpectedly. 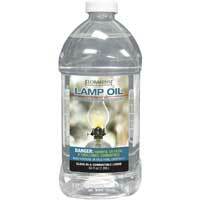 Use room temperature oil to fill lamps. Lamp oil exposed to heat expands while temperatures below 20 degrees fahrenheit will cause freezing; both temperature reactions prevent the oil from ideal burning. For maintaining the best flame and lamp function, remove coal particles at the end of the wick after 12 hours of burning. Learn how to trim wicks here. There are many oil lamp fuel options. Just as there are many styles of oil lamps. Technically you can burn any oil to create light. Only a few oil lamp oils are approved by national standards. Yet, there are others worth mentioning. In Table 2 below see the list of approved oil lamp fuels to use in cold blast oil lanterns and flat wick oil lamps. In addition to lamp oil and kerosene (more info about lamp oil vs. kerosene), which are approved fuels, some oil lamps are built to operate with olive oil, nut and seed oils, hemp oil, vegetable oil, fish oil, castor oil and others. Butter, tallow or fish oil can be burned for a smoky light. Sesame oil and peanut oil are popular oils for burning, but the cleanest burning oil is olive oil. We do not recommend burning olive oil in a conventional kerosene lamp or lantern; but you can make or retrofit an olive oil lamp of your own! Read more about burning olive oil in an oil lamp. Kitchen oils like these wick slower so they require a shorter wick distance between the burner and oil. Conventional oil lamps and lanterns, especially those with 1/2" wide wicks or larger, do not adequately draw up the oil. The quality of the lamp or lantern burn is affected by the size of the wick, how far it is from the oil, and the properties of the oil, among other factors. Use strategic caution when trying new fuel oil and oil lamps; do your research and experiment. We hope you love excuses for science experiments just as much as we do. It is not recommended to use citronella oil or tiki torch oil in kerosene lamps or lanterns. Nevertheless, citronella oil and tiki torch oil can be burned in kerosene oil lamps and lanterns only outdoors. These oils are designed to produce smoke and harmful particulate matter for repelling bugs. Burning citronella oil or tiki torch oil in a kerosene oil lamp will quickly deteriorate the wick and is hard to remove from the lamp. For a cleaner burn mix with 50:50 kerosene. So, you want to burn an oil lamp inside without the harmful effects of particulate matter and smoke from incomplete kerosene combustion? We can help. 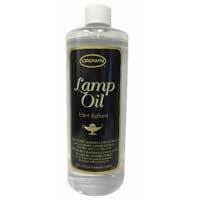 From conventional indoor oil for lamps to oils we have in our kitchen there are loads of indoor lamp oil options. Fuels approved for indoor use are listed in Table 2 below. Present day oil lamps standardly use what is known as "lamp oil." It is derived from the same hydrocarbons as kerosene but is significantly refined to produce little or no smoke and odor. Like all things, lamp oil varies in quality and performance. It takes some experimenting to find your favorite. For thousands of years humans have used olive oil for indoor lamp lighting. Olive oil is 99% pure and burns at a much slower and lower temperature than petroleum-based oils. There is no smoke, odor or harmful byproducts produced when burning an olive oil lamp. Because olive oil has a higher flash point and is "heavier" the wick and burner must be very close to the oil, unlike most antique oil lamps. Read more about burning olive oil in lamps here. 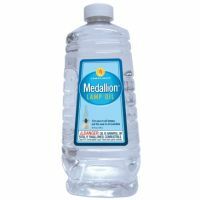 The best affordable indoor lamp oil will come the list in table 2. Perhaps olive oil is the healthiest indoor lamp oil, since it has no impurities to begin with. However, the approved clear lamp fuels are too sold as having no toxic byproducts. If you find a comparative academic study of lamp oil combustion byproducts or have more information, send it to us! What kind of oil goes into a lamp? Table 2 below lists the approved fuels for safe to use inside or outside in flat wick oil lamps, round wick oil lamps and old fashioned tubular lanterns. 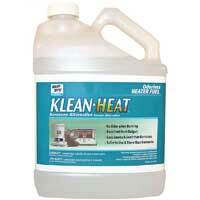 Klean heat, among the other fuels listed in table 2, is readily available at most hardware stores. These fuels are suitable for all oil lamp sizes. For a discussion of all types of oil lamp oil click here. Paraffin Oil bought in the United States (lamplight farms sells these varieties like "Ultra-Pure") should only be used in small lamp and lanterns with a 1/2" wick or less. No paraffin oil is listed in table 2. The Dietz Comet Lantern, these small oil lanterns, and this #0 solid brass burner are examples of small oil burners you can use paraffin oil in. For more about what´s up with paraffin oil, read more here. The approved fuels for outdoor use can be found in table 3. Kerosene bought from a gas station should be from a "blocked" pump which means it is clear and not dyed red. Dyed kerosene or fuel will cause the wick to clog over time, which leads to an improperly functioning lamp. Dyed fuel oils can cause permanent stains on oil lamp glass and metal. *For extended wick life cut 50:50 with kerosene. In table 3 you may notice you can burn tiki torch fuel in an oil lamp, but only outside. The chemical makeup of the fuel creates more smoke and particulate matter byproducts hazardous to health when burned; you really dont want to be inside breathing it. More about using tiki torch oil in oil lamps. Diesel, biodiesel and olive oil have a flashpoint over 200 degrees fahrenheit are not suitable substitutes for any of the fuels listed in table 2 and 3. However, you can make your own artisan olive oil lamp or retrofit your kerosene lamp burner for olive oil; get the olive oil scoop here. Successfully burning olive oil depends on the size and build of your oil lamp. Conventional lanterns and lamps are designed to wick up petroleum lantern fuels. Petroleum fuels have a higher viscosity and require more distance from the wick to the burner. The opposite is true for olive oil and most other oils of our kitchen cabinets. If you want to burn olive oil in a lamp, its easy to make one yourself, see our blog post with DIY olive oil lamp instructions. The cleanest burning fuel is olive oil, the fuel that Aaron was directed to use for temple light in the book of Exodus. Olive oil is more than 99% pure. If the wick is properly trimmed and there is no draft, it should not smoke. Olive oil is a clean renewable fuel that does not produce smoke or odor. The concept of burning vegetable oil (olive oil) in the home rather than petroleum based kerosene is quite appealing, less toxic and much safer. Those who are sensitive to fumes in kerosene or paraffin can light a pleasant flame with olive oil. It is good for our environment. Each year the renewable fuel oil supply is replenished by trees which produce oxygen as they grow. No complex methods are needed to manufacture or refine the oil. Oil is simply pressed from olives, two thirds of which is oil, and strained. Used as a fuel, olive oil is not expensive. In general it is cheaper to burn than most candles. The cost of burning an olive oil lamp will depend on the size of the wick. The size of the wick determines size of flame and corresponding fuel consumption. If you spill your lit olive oil lamp on the floor it will be smothered and not ignite. Burning olive oil is the cleanest fuel and it is no more complicated to figure out how to use than the profitable petroleum fuels introduced in the 1850s. Flat wick lamps and lanterns are designed to burn brightest with kerosene fuel, but clear lamp oil works just fine too. A popular lamp oil choice is K-1 kerosene, which is affordable and readily available from filling stations or in prepackaged containers. Sulfur and other impurities make kerosene smell. Burning a kerosene lamp oil outside takes care of the pungent odor, however the smell is unmistakable if you burn it indoors. The only approved kerosene for indoor use is KleenHeat; a form of refined kerosene thats smoke and odor free. KleenHeat is advertized to burn clean with no harmful chemicals or inputs to incomplete combustion. See our list of approved lamp oils suitable for inside and outside use. Indoor burning of kerosene oil lamps and heaters must be ventilated. If the power is out and the weather is freezing adequate ventilation may be a problem. Sure, kerosene has been used for heat and light for about 170 years and it may be just right for you, but it can be life threatening if youre burning it in a small space with no ventilation. Burning kerosene fuel oil releases the odorless gas carbon monoxide; which is poisonous to humans and life threatening - read about carbon monoxide here. Kerosene lamps also produce black carbon, a byproduct of incomplete combustion. Black carbon has serious health effects and contributes more to atmospheric warming than carbon dioxide. Read more about how kerosene lamps impact your health. Using kerosene can stain your oil lanterns and lamps, especially the colored variety ment for industrial equipment. Read about the other types of oil lamp oil; did you know olive oil was used for thousands of years in oil lamps? The minimum recommended flashpoint of kerosene is 124 degrees. Kerosene for oil lamps should be between 124 and 150 degrees fahrenheit. Flash points above 150 degrees contribute to reports of lanterns developing run away flames; when the flame flares upward and burns uncontrollably. If you experience a run-away flame the only way to put it out is to smother it - place a bucket over the lamp or shovel on the dirt to put out the flame. When it comes to fueling the lamps and lanterns that add that cozy glow to your home in winter months - which is better, common lamp oil or kerosene? There´s a difference between common lamp oil and paraffin oil, read about it below. Or just skip to the list of lamp oil approved for indoor use. Paraffin oil in the United States is meant for small oil lamps and lanterns like these (with wicks smaller than 1/4" round or 1/2" flat). Lamp oil is in the same chemical family as kerosene but impurities have been removed so it burns cleaner. Lamp oil is more expensive than kerosene due to the extra steps needed to purify the oil resulting in significantly less impurities released into the air when burned. 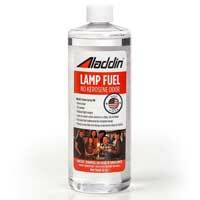 Best quality lamp oils will be virtually smokeless and without an odor. Not all lamp oils are created equally. There are many oil varieties available with varying degrees of purity, viscosity (thickness), flash point, and other properties that affect burning. Kerosene is the cheaper option and some old timers will tell you kerosene makes flat wick lanterns burn brightest. It is available in synthetic kerosene, red kerosene and K-1. Red kerosene is dyed for regulation purposes and is meant to fuel industrial equipment. Never burn red kerosene indoors because the byproducts from the red dye can be harmful. K-1 kerosene should not be burned indoors unless properly vented, you can read more about kerosene lamp oil here. Despite being more of a wallet eater, to keep indoor air clean and healthy, use lamp oil in your indoor oil lamps and oil lanterns. Again, here´s the list of lamp oil to burn indoors. Paraffin oil is NOT the same as lamp oil. Paraffin oil sold in the United Kingdom is kerosene. Paraffin oil in the United States is liquid candle wax and is improperly labeled for use in oil lamps and lanterns. USA paraffin oil is only suited for candle oil lamps that use small diameter (1/4" and less) round wick. USA Paraffin oil is not manufactured for use in tubular lanterns, flat wick oil lamps, Kosmos oil lamps or matador oil lamps. Paraffin oil, the liquid candle wax variety, only burns half as bright as lamp oil or kerosene. For lamp oil to use indoor or outside see the approved lamp oil fuel list. The differences between paraffin oil and kerosene shown in table 1 contribute to paraffin oil inhibiting the normal capillary function of the wick and will cause wicks larger than 7/8 to burn turbulently. If a wick has been contaminated with paraffin oil it must be replaced for proper burning to resume. Trade names of paraffin oil sold in the United States that should be avoided unless with wicks smaller than 1/4 round or 1/2 flat. Or any other Explosive Fuel with a flash point under 1000 F.
Although it may be tempting, when picking the oil to use in an oil lamp the best advice is not to experiment; use the fuel designed for use with your product. Learn the approved indoor and outdoor oils for lamps and lanterns. Using approved oils will fast track you to a clean-burning lantern that´s a joy to operate. Tiki torch fuel is petroleum-based and meant only for outside use and for repelling insects. Tiki torch fuel smokes when it is burned. If you must use tiki torch fuel in an oil lamp, it is only safe to do so outside and it can be cut with 50:50 kerosene to achieve a longer wick life. The tiki torch oils approved for outdoor use in oil lamps are listed in table 3 under approved outdoor oil for lamps. Finally, lamp oil can be safely used in tiki torches. However, the flame performance and insect repelling smoke will be effectively lessened. According to the National Fuel Gas Code Handbook Carbon Monoxide (CO) is, "a colorless, odorless", poisonous gas that results from the incomplete burning of "common" fuels such as natural or liquefied petroleum gas (LP-Gas), oil, wood, or coal. When CO is inhaled, it enters the bloodstream and reduces the ability of the blood to carry oxygen to vital organs, such as the heart and the brain. The dangers of carbon monoxide exposure depend on a number of variables like overall health and activity level. Infants, pregnant women and those with physical conditions that limit their bodys ability to use oxygen - asthma, heart disease, etc. - can be more severely affected by lower concentrations of carbon monoxide than healthy adults. CO poisoning can be mistaken with flu symptoms, food poisoning and others. Some symptoms include shortness of breath, nausea, dizziness, lightheadedness or headaches. High levels of CO can be fatal, causing death within minutes. According to the Centers for Disease Control and Prevention , an estimated 15,200 people were treated annually during 20012003 in emergency departments for nonfatal, unintentional, non-fire-related carbon monoxide exposure. During 20012002, the CDC estimates 480 people died, on average, each year from unintentional non fire-related carbon monoxide exposure. You´re already well on your way to prevent unhealthy carbon monoxide exposure. Becoming informed is step one. Install a carbon monoxide detector inside your home, especially if youre burning oil lamps inside, it could save your life! Replace the battery in your detector when you change the clocks in the spring and fall. Place the detector where it will wake you up if it goes off, like outside your bedroom door. Black carbon is generated by burning kerosene. Kerosene oil wick lamps produce a very bright flame and black carbon as a incomplete combustion byproduct of burning kerosene. This carbon must be trimmed off the wick before each use (how to trim a wick). This is the same sooty black material produced by coal power plants. Black carbon is an air pollutant, according to the US Environmental Protection Agency, because it comprises a significant portion of particulate matter. The EPA explains, "Inhalation of black carbon is associated with health problems including respiratory and cardiovascular disease, cancer, and even birth defects." To answer the whole of this question it is important to understand that across the world, many people in developing countries use kerosene lamps every day. K-1 kerosene is the cheapest fuel to buy for an oil lamp and if youre using it every day youll want the most affordable fuel option. Those without electric lighting carry a huge disportionate health risk exposure. In a 2012 epidemiological study in Nepal researchers at UC Berkeley´s School of Public Health found, women who used kerosene lamps in the home had 9.4 times the rate of tuberculosis in households that did not use lamps. The takeaway: There are personal health implications when burning kerosene. For infrequent oil lamp and lantern users you have nothing to worry about. If youre outside, youll hot be exposed to anything bad for your health. If you do intend to burn oil lamps and lanterns indoors, use a fuel like kleenheat - a refined kerosene sold for complete combustion and no black emissions. Our list of approved lamp oils includes fuel oils safe to use indoors. Conventional lamp oil is made from paraffin and kerosene that is refined from petroleum. Petroleum is heated to capture and condense vapors into liquids. The liquid kerosene/paraffin products are further refined into lamp oil that´s free of molecules that cause smoke and odor. Due to numerous lamp oil manufacturers and product lines the proportions of chemicals in lamp oils vary. It would be preposterous to provide one chemical formula to describe lamp oil. The refining of these fossil fuel hydrocarbons create is a very cheap way to produce clean-burning low-temperature fuels safe to use inside. The use of kerosene and paraffin as lamp oil began in the early 1800s ago. Before that people used renewable fuels like olive oil. Want to know more? Get the scoop on all types of lantern fuel and burning olive oil in an oil lamp. Lamp oil made from petroleum hydrocarbons like kerosene and paraffin oil will slowly volatilize or evaporate over time. Always store lamp oil with a properly fitting cap to ensure maximum shelf life. 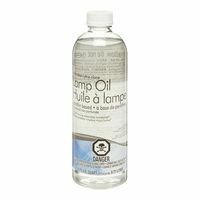 Evaporation reduces the lamp oil shelf life casing it to become thick and rendering it unusable. Lamp oil does not evaporate as quickly as gasoline. To determine if a bottle of lamp oil is too old to use you can inspect how clear it is. If it is discolored or cloudy or thick it is probably past its time. If it is clear the oil is likely safe to use. If the oil is questionable, responsibly dispose of it and replenish your supply; better to be healthy and have working gunk-free lanterns and oil lamps. Does lamp oil expire? Unlike solvents that degrade, oil is stable over time. In fact, unrefined oils last for millions of years. Petroleum-based approved lantern fuels have varying qualities which varies how they last when exposed to different conditions. In general, any age oil that looks and smells normal should work just fine. However, the longer an oil has been sitting in a plastic or metal container the more chance for container molecules to taint the oil. Thus, over time oil becomes less refined as it assimilates molecules from its environment. Its never a good idea to use old oil (like decade old oil) inside.